Every now and then a game appears that is just different from the rest, and Seashine from Patrick Ellis is one of those. The game’s motto is “How long will you survive in the abyss?” and that’s what it’s all about. You have to guide a small jellyfish in the abyss, avoid the predators and look for safe passage. Aside from guiding the jellyfish, your goal is to set the highest score you can get, and you can do this by going deeper and deeper into the various passageways and underwater caves. Avoid the predatory fish and do your best to go after the light sources to help you navigate the environment, and you will go far. 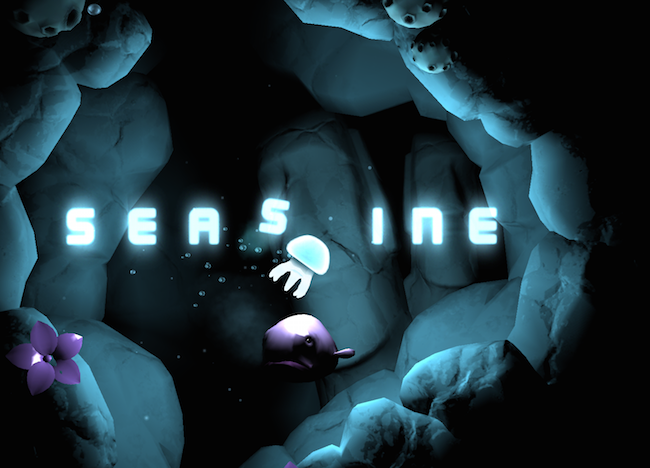 Seashine starts with a tutorial: you swipe to control the jellyfish’s floating movement and tap to collect the stars to get some light. There isn’t a lot of info in the tutorial and that’s perfectly understandable as the objective is to explore your surroundings and learn on the go. The graphics are nice and dark, and the caves and passages make movement difficult at first. However once you get the hang of the controls you can navigate through the caves and progress through the more complex levels. If you can get enough stars, you will be able to trade these for poison cures, speed boost and other power ups. The real strength of Seashine is the presentation: the music is appropriate for the gameplay, and as you move you’ll see a lot of creatures swimming around, some harmless and others predatory. It is this mix of wonder and threat that make Seashine compelling.